In Kerala, while we travelled early morning typically during the early school hours around 8:00am, It was wonderful to see kids boys and girls alike packed in their school buses or walking in a long file on green grass to get their daily dose of education. I remember Surya saying he was so happy to see kids trot to school unlike his state of UP. The schools too were fairly well established. Most of the boys out stretching their hands to high-five us travellers, perhaps a sense of adventure they enjoyed by doing that while girls just stared from the corner of their eyes and giggled. No religion stopped them from getting their share of education. Just as kids, all travellers along the road were equally perplexed by two cyclists carrying a small back-pack along. Doesn’t it feel good to enjoy a brief chat with a total stranger who asks you about your native, the road you travel and then finally wishes a warm luck from his heart? At times motorcycle riders used to travel alongside us and kept talking. Near Ankola a rider almost kept chatting for 5 minutes covering well over 2-3 km, in Kerala a random rider would start in Malayalam and after acknowledging our reactions would promptly start in English. Travelling always takes you along some beautiful places. And its at these places you wonder that all the slogging we do at our work in cities is for a peaceful life. 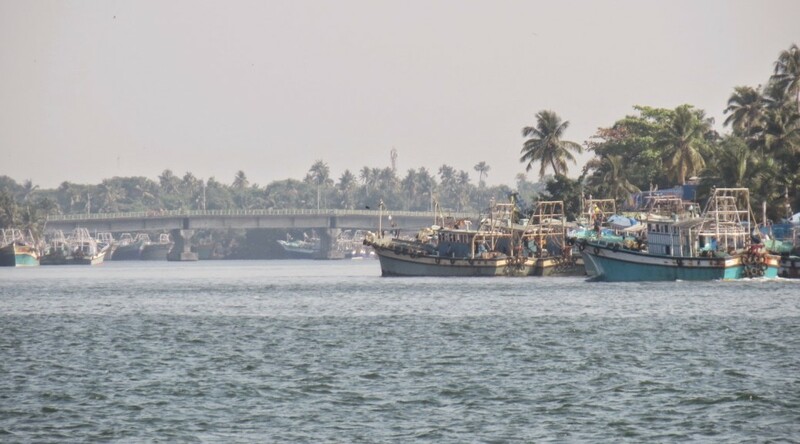 While travelling through Padukere road near Malpe, the residents of that road had a narrow land strip of 20km to themselves with sea and back water bordering it and a small lovely cottage for their dwelling amidst coconut trees. I wonder if the richest could afford such a peaceful luxury in the urban jungles. Life completing a full circle over here, with the natives enjoying their daily chores in the surroundings. The joy of discovering a new town everyday! Every single moment on the trip we ended up looking and experiencing something new. Every evening when we headed out after our wash into the new town / village we’d experience the similar but still a different vibe of the place. Even in urban Mangalore, we discovered the special taste that people had for “Gobi Manchurian” which further down south was intact as a vegetarian delicacy – though the name of the dish getting corrupt to “Gopi Manjuri”. The entire southern India’s effort to keep their waters clean was astounding, no where from Goa to Kanyakumari did we find plastic bottles or bags or filth floating in the water, they kept it clean as their own surroundings. The love people had for southern cinema, especially the male actors – they were worshipped! Leave aside Rajni sir, even newer entrants like Surya had fan following and fan-clubs in villages with their posters. Southern India has a special liking to worship. Once I found a poster of Paul Walker with bold lettering – Always Remembered ! That place was a car garage! Most of our journey was through Kerala, it wouldn’t be wrong if I could call this a Kerala trip. In Kerala people love fruits, every corner you’ll find neatly decorated and arranged fruit shops. And its these fruits that we loved through out our journey. I must’ve had over 20 Pineapple juice glasses and addition to it was Black Grapes, Mosambi for Surya and our ever-green Sugarcane juice. Sugarcane was like our recreational drug – every time we had it on a hot, sweaty day, It gave us an instant high. Bananas – I generally dislike bananas, but I found them as best source of early morning diet. It was definitely on this trip that I’ve really understood the importance fruits and the flavour along with colour that it adds to the life. Every new day that we started, we were apprehensive of the road, the people, the route, whether we’d have a problem with our cycles… But as the day followed the negative thoughts moved away and we absorbed the moment as it was. By the end of the day it gave you a sense of victory that we’d travelled around 100km unscathed and joyous. There is obviously more to the trip but somethings are left best to be experienced hot and first hand rather than reading it on your cool office bay. We woke up casually knowing there will be no more day long cycling on this trip, but that meant it was still early by the urban standards – 7.00am. We left for Swami Vivekananda Rock Memorial after a quick breakfast. It was low tide and the ferry to the Thiruvalluvar statue cancelled. At the memorial we enjoyed the 360 degree view of the water more. Back on the mainland we had a v. bad lunch at a dhaba which advertised Rajasthani, Marathi, Bihari and all types of cuisines, the kid waiter too well aware there is nothing like as advertised. By evening we again moved out on the beach for the sunset and roamed around saw the fish-display. Back at the hotel room, we were able to get English and Hindi news channel, which was must since we had to spend some time here. Entire day was eventless ! Continuing for another day Sir ? 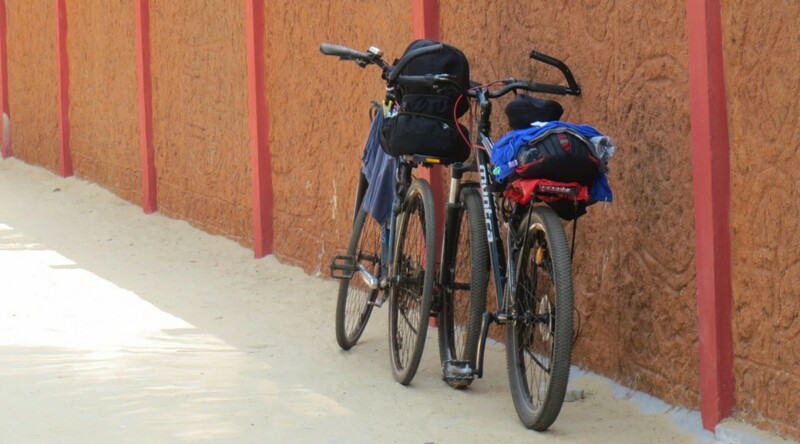 However today we atleast had one task at hand – parcelling our cycles back to Mumbai. We were gonna ship it on next day’s train to Mumbai – ie on Feb 28, that would’ve reached Mumbai early morning on 2nd March, perfect for us as we would’ve reached Mumbai on 1st and picked our cycles the other day before office. So we headed out with our cycles, I asked Surya we should just check more of Kanyakumari on the western front, and we continued on that direction. Through small villages, etc, I saw a nice river crossing and said we’d return back from there, When we reached the river crossing of Manakudy, Nagercoil was just around 10km away. On the way back we did find the board stating – Kanyakumari with that big underline. We asked a rickshaw driver to take our snaps with our cycles held high over our head. At the Kanyakumari Railyway station, we had travelled well over 16km for fun! unnecessarily along the the Southern sweltering sun soaked shoreline. At the station, we purchased parcel tickets for the cycles costing around ₹640 and the coolie packed our seats with a gunny bag nylon cloth writing out some random nos. over it and said. Go !, now its railway responsibility ! We dozed off, and again by 5.30pm headed for a stroll around the beach. Came back and had dinner at the hotel’s restaurant finishing our last day in Kanyakumari. Our cycles set for the journey of 2130 km. At TVM, both of us were having bad headache, I also found my entire body was aching, I wondered if I hadn’t contracted any viral fever. We quickly found a hotel and immediately dozed off, in the noon headed for lunch came back, and again dozed off. By early afternoon when we woke up, Surya felt better, I still felt my head heavy. We roamed along the Chalai Bazar towards the Padmanabhaswamy temple. There was post-graduate student’s peaceful agitation going on in the M. Gandhi Park. We stayed there for some time, trying to comprehend the Malayalam language and headed towards the temple when it started raining. After the quick rain, we enjoyed the temple drama of specific dress code, etc and came back to the hotel. At night after dinner at the same hotel we were dead tired, today we hadn’t cycled a bit, still were exhausted. Tomorrow, it’ll be our home – back to Mumbai, Maharashtra. We had late morning flight to catch, we thought we’ll enjoy the last mode of transport that had been missing in our trip – the bus. We took a bus to the domestic airtport from M. G. Park to Shangumugham Beach. The ride through a foreign town in its public transport system has a charm of its own. Whether its Metro in Delhi, a tram in Kolkata or a bus in TVM. There is always something interesting. Over here Surya found out none of the buses had windows – just a thick clothed curtain like cover and the exit door of the bus always has to be slammed hard. Probably it was a tradition. On the beach we found a lovely mermaid enjoying the sunbath and an equally relaxed human with folded legs and arms behind his head enjoying the morning. The beach water was just as blue as it could get, a sight on this trip – the blue waters south of Kollam, that just kept you intrigued. The Air India AI 668 flight was on time and luckily we were served lunch by a relatively young air hostess 😀 who even asked me if I had ran the corporate relay marathon after looking at my red t-shirt. As we touched Mumbai, the loop was completed, the circuit closed and the end of the journey. A tour that would’ve etched events on our life, stories that would be remembered for a long time to come. Left around 7:15am, excited that today is the day! The Parassala town which is the border town of Kerala and Tamil Nadu isn’t really exciting. Forget a buzzing border, but there isn’t even a warm welcoming sign as we cross into Tamil Nadu, our 4th state in this trip of ours. However Kerala did bid us a farewell. The road was really bad in terms of riding. First it was quite frequently climbing hills, then it wasn’t the widest of stretches of the NH-47 with a slurry of buses and cars all along, to add to the misery it wasn’t smoothest and the cleanest as well. These attributes took away a chunk of enjoyment when we stopped for a tea break around 8:40 am, Nagercoil was still 20km away. We had just managed around 15 ~ 20 km in last 1 and half hours. We saw huge mountains to our left and wondered if we had to cross them. By the look of those, they were ominous, however the road navigated from the sides and we reached the southernmost big town of Nagercoil arond 10:15am. Had our share of Pineapple, mosambi and black grape juices. We saw the sign of “Kanyakumari – 20km”. When we were back on our saddles, Surya said that he wanted to capture a photograph of the milestones at the distance of 20km, 15km, 10km, 9, 8 and so on until we reached the underline – Typically each of the towns / villages at the centre had a milestone / board with its name written and an underline and not really a Zero (0). The roads continued to be bad at least 2km ahead of Nagercoil, but then we headed into the typical southern scenery. Tamil Nadu is one of India’s highest Banana producers, and this did reflect well along the road. Typical village cutting roads, with banana plantations on both the sides spreading acres on every flat land available with huge mountains as the backdrop. 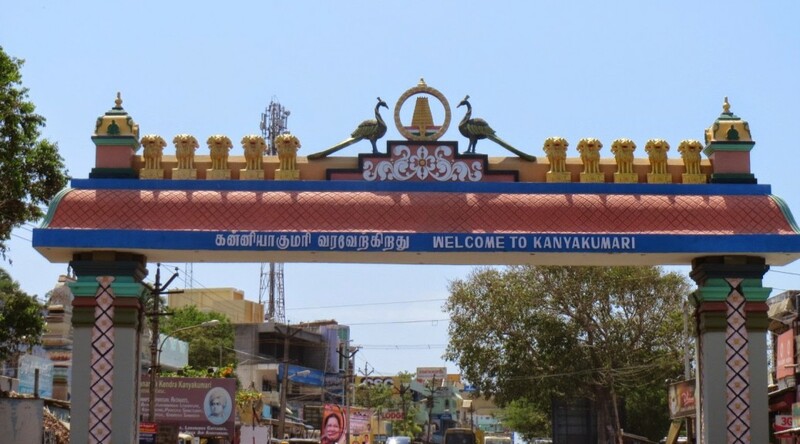 Around 2kms to Kanyakumari, and we saw a huge semi-circular board above the road – “Welcome to Kanyakumari”. It was close to noon. Into the southernmost tip of the Indian Subcontinent, Cape Camorin, the cyclists kept pedalling. We got into the Vivekananda Kendra and checked out its surroundings, the rooms were full and it needed a pre-booking of 6 months. We roamed on the cycle in the kendra full of ashrams, meditation centre, temple, museum like exibits, school and its own beach to enjoy the sunset. The sunset point at this beach was a little untimely for us with the noon sun blaring with its full intensity. Then we moved further south as long as we could travel where we finally met the sea. Quite literally the tip! Couldn’t get any further south on this Indian peninsula ! We checked into “Maadhini Hotel” after a round of sugarcane juice and had our lunch in the basement restaurant. At 4.00pm we headed out again towards the Railway station to find about shipping the cycles back to Mumbai. The sleepy station was having an empty booking window, the guy estimated that it’d take around ₹700 to package the bicycles. Back on the road we roamed along the southern tip and enjoyed the setting sun which in this place seemed to have emerged from the sea itself and merge back into the ocean. 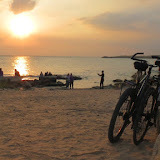 In the night as we strolled along – without our cycles – It was a little difficult for us to believe – We were in Kanyakumari! After last night’s chit-chat with Ingrid and her friend, we left Varkala around 8.00am following the normal routine of having some biscuits to munch and then head out. Google Maps had suggested a route (I had picked up a walking route). Google Maps made every effort that we walk that route. It started off from Varkala then heading into a small village and then a sudden climb on a small rocky road, which could just be tread on cycle, soon the climb was little too much for us and we climbed down and followed the stretch. It overlooked the lovely beach below through red rocky terrain laced with coconut trees with blue waters bordered with golden sands below. ऋतु, मुझे फिर पाठशाला में जाके पढाई करनी है, क्या दिन थे वह. We took a right again towards the west to continue on a coastal flat, straight road of around 7 km taking us all the way to Thumba! The road was a little disappointing, even though it showed in maps it was close to the beach, hardly we could see and feel the water and its ambiance. As we reached Thumba, we were stopped by a local suggesting to take another route as this was a restricted area from where “rockets fly”. He was referring to the Thumba Launch station. As we crossed Thumba, the ‘big city’ started welcoming us, first with huge residential apartments and other “Software / Industrial Parks”. Unmistakably, we were heading into the capital of Kerala, Thiruvananthapuram. We spotted a sugarcane juice vendor and we did kick off his day, his sugarcane juice even had a dash of ginger along with lime. We had our breakfast on the outskirts of TVM around 11 am in another “New Arya’s Veg. Hotel”. This one too had the same menu on the offering. There on, we headed straight into the heart of the city, thought we could even have a glance at the famous Padmanabhawamy Temple, the temple where a rich stash of gold over ₹1000 Cr. was found in just one of the three vaults. As we roamed around the outskirts temple, trying to get through the security, a foreign couple asked me where had we been travelling from, when I answered Goa, both were stunned not just because it was really long way away but because he saw we just carried the measly backpacks with almost nothing in it. the temple’s God had a timing and we couldn’t get in. We headed straight down south for our night halt. Through the heat and an evolving city, the path along NH-47 took us to Neyyattinkara which was the last big town of Kerala. We reached there around 3.00 pm where we quickly found a lodge and went through our washing chores. When we emerged from it we were ready to explore. First up, food. We had snacks of dosa, vada and tea and headed out into a close by temple where the serene surrounding relaxed us. 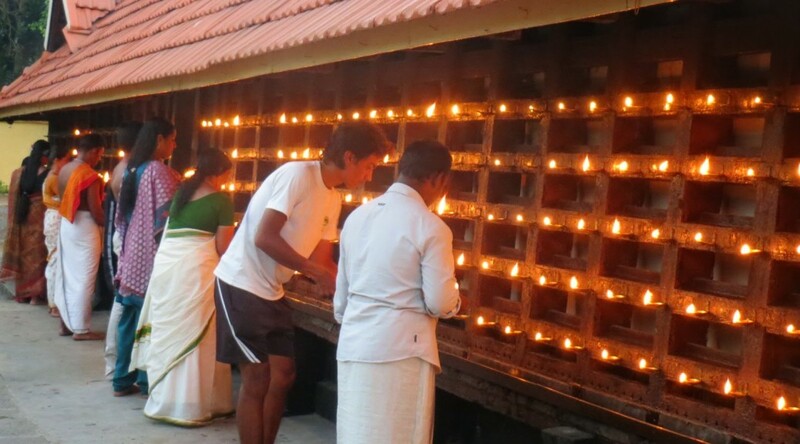 The temple following the south Indian tradition of having a 1000 lamps was getting ready for the evening prayer. People started coming in and helping up light the lamps. It was a daily ritual which really took “team effort”. An uncle doing the same asked Surya if he could take his picture, Surya obliged. Smiling uncle responded – “facebook upload”. We smiled, Facebook has really peculated. I asked another uncle which God’s temple it is, he said Krishna, then gestured with his hands as a ‘small’. When I asked whether it was that of “Bal Krishna” his face lit up and he nodded and smiled back. After our HIndu spiritual connect, we took a rickshaw and went to check out the CSI Amravilla church, which had closed it doors, this God like Padmanabhawamy had his timings. We came back and had our dinner at a pure veg. restaurant which served us Chettinad Paneer which was a dark gravy dish full of condiments and spice with a rich hand of “garam masala”. Back at the lodge, we awaited for the next day. The day when we’d reach our final destination. Yet another day, and we are on our bikes by 7.30am. Leaving Alappuzha on the NH-47 (Salem – Kochi – Kanyakumari Highway) we are followed by the CPI(M) flags, banners. The road is very uninteresting, flat and straight. A little before Karunagapally, we witness an accident. An auto-rickshaw parked across the flow of the road, with crowd surrounding it. Cars, trucks and vehicles from either side waiting for the ‘problem’ to clear. A few men were helping a lady lay flat on the road, who seemed unconscious. As we walked past the crowd, a car stopped, few men helped the woman in the car along with another lady to assist her. I realized on the highway, things can turn sour in a flash. We stopped for our Pineapple juice stop where I thought we might as well help ourselves with some food. We ate some thick dosas and appams which reminded me of pancakes. The road remained boring till we reached outskirts of Kollam, where the buzz of a big city inspired us to be looking out for some excitement or change. 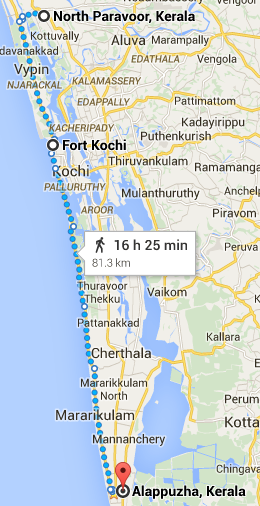 We asked for directions of Kollam beach and reached there around 12.30pm. When we turned in towards the beach road, we were welcomed by dark blue patch, this patch turned out to be the sea ! BLUE ! This colour of the sea was the bluest I had ever seen. I was mesmerized by its colour for a moment. But then I returned back to reality of the harsh heat of the midday Kollam sun. 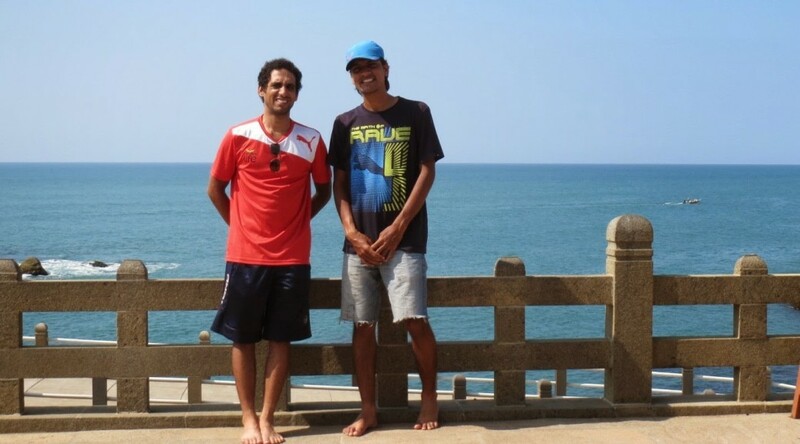 We headed for a beach side shade, where Surya kept chatting on the phone with his Couch surfing guests who happened to be in Varkala. After some relaxing time in the shade, we headed for lunch at Hotel Prasanthi. Here a waiter first walked up to our table, hearing us talk in Hindi, he retrieved and asked another Nepali-looking waiter to tend to our requests. Only meal (thali with rice) was on offer. It was a huge plate with 10 small bowls of chutneys, rasam, curd, sambhar, vegetables and a sweet made of jaggery. Around 1.30 we headed for Varakala, which was around 30km away. First I had to get my height of the seat adjusted, I found a bike repair shop and got it set. Now it felt so much better! But riding in the sun is no fun. Soon on the outskirts we stop for drinking mazza and cool off. The road ahead was climbing up and down heading east, till we took a right at Chathannoor taking us westwards towards the sea. We stopped again near a primary school at Meenadu. Relaxing taking pictures of kids playing around. Some of them trying to interact with us, while most girls just shying away. 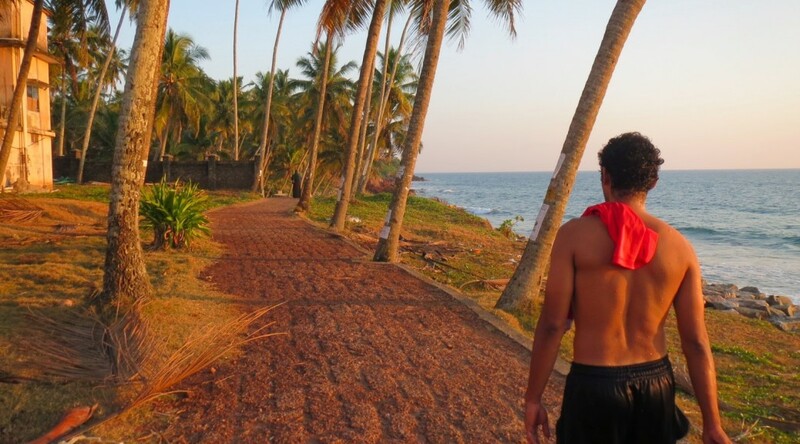 As we reached closer to the beach, the mundane scenery vanished and we were welcomed by lovely Kappil beach. Riding on a new laid road with clean markers and lines was good enough, but the blue sea on the right and backwater to the left made it special. Reminding us of Marvanthe beach in Karnataka. I took out my phone and tried to grab a video of this ride. Road leading into Varkala was in a hilly terrain. We reached around 5.00pm and while we were trying to find a cottage suggested by Surya’s couch surfers, Surya spotted them walking. A short fellow with long blonde hair and a taller slim woman with short hair. After introductions and hi and hellos we fixed the cottage and headed for the beach. Where I relaxed in a small cove like beach which was only a hundred meter wide. It had to be climbed down from the hill overlooking the sea. After the swim, I headed for shower back in the cottage, while Surya who had already freshened and didn’t venture into the sea went along with Ondur (the guy) and Ingrid, chatting along. I called him around 7.30 for food, when he said Ondur will come back to our cottage and we’d go for dinner. When he took me to the place, it reminded me of Aarambol. A small hilly road directly overlooking the beach below. The road full of shacks, shops, restaurants just trying to attract foreign tourists. We stopped at one restaurant which offered live music, which at best was a guy strumming something all to himself and another lady beating the bongos. The food was just as bad and we had to wait over 30 minutes to get our order of chapatis. By the time we reached back to the cottage it was 11. Yet we continued to chat. Only Ingrid and Ondur realized it was really late for us cyclists, that we head to our beds. Left N. Paravoor around 7.30am, again crossing the backwater heading westwards for Cherai. A left took us all the way towards Vypin and southwards. 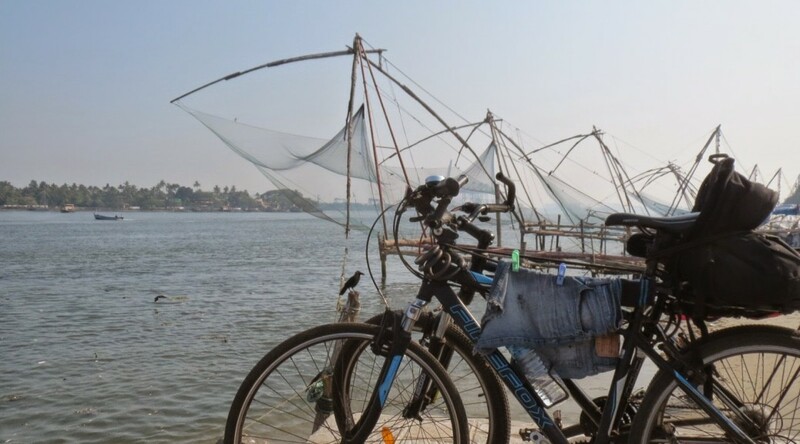 The morning ride was spent singing ‘Mona Mona Gosolina’ as we reached the northern side of Fort Kochi. We had left the NH-17, which was our partner from Goa till this place. Waiting for the ferry, we had some tea and crossed the huge Lake Vembanad and landed on the shores of Fort Kochi, Kochi! Last time I was here it was on a cycle with an engine, this time without it ! It was the first time I felt that we did travel some distance and now were really into the heart of Kerala. We spent time by the Chinese fishing nets and enjoyed another round of tea. beef curry, mutton curry, egg curry, chicken curry, parota…. I stopped him, and asked for Veg. to which was the award winning response. When I narrated this to Surya, he laughed and was too scared to try this eatery where the owner considers egg of a Duck as veg. !. We moved on. Further up around 11.30am, we stopped when we saw a decent baker shop for juice at Pallithode. We had Pineapple and Black grape juice, since we wanted more, we asked for Mazza, this time we sure to check if it was the original one. The owner, an aunty suggested we go to the near by Picnic spot at Andhakaranazhai Beach. I remembered, the bridge and the construction by the beach, it was a tourist building with some shops, etc. We headed to the end of the beach where we found a spot beneath the trees on the sand where we found locals playing cards (probably Rummi). We rested there for some time, Surya even found time for Forty Winks. After spending an hour at the small eatery, we headed for Alappuzha which came early by 3.30pm. Around 4 – 4.30 we found a lovely 200 year old heritage home / hotel – Vrundavan Heritage Home. A beautiful old traditional home of a squarish garden right in the centre. with rooms all around it. We headed out for the beach later after Surya got his shave at a barber. At the beach, CPI party’s flags were all along, there was a football tournament with commentary and spectators. We too enjoyed the match for some time and then had some tea and snacks of pakoras of chilli and potatoes. 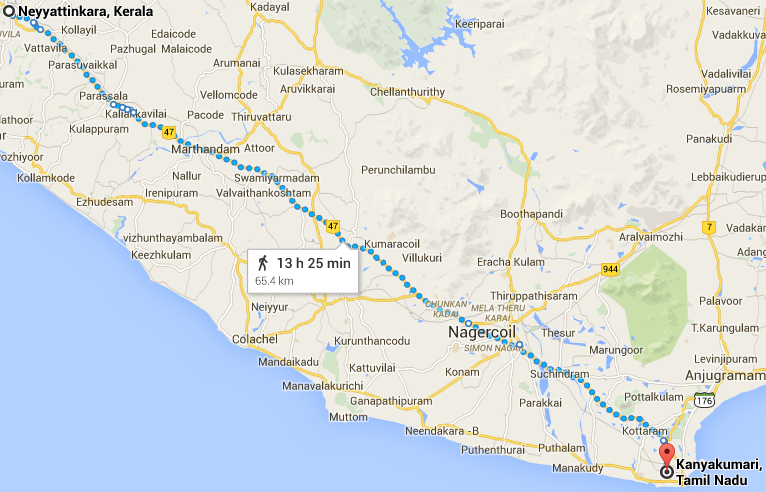 I found out an “Arya’s Veg Restaurant” which was 2 km. away from the beach and decided we could have dinner there. We walked almost 4-5 kms from our hotel to the beach and then to the hotel – Only to find it served the same old, short, stunted menu. I had a few dosas, parota and aloo subzi listening to the Marathi and Gujarati tourists conversations. We returned back in an auto-rickshaw. It felt awesome, the road buzzed behind, and we didn’t have to pedal ! It was a strange feeling and a comfortable one too. Back at the hotel, the manager was chilling out with the foreigners, I asked him that if we could settle today itself since, tomorrow we’d be leaving early for Kollam. We paid him, he didn’t even bother to register our names in his log. 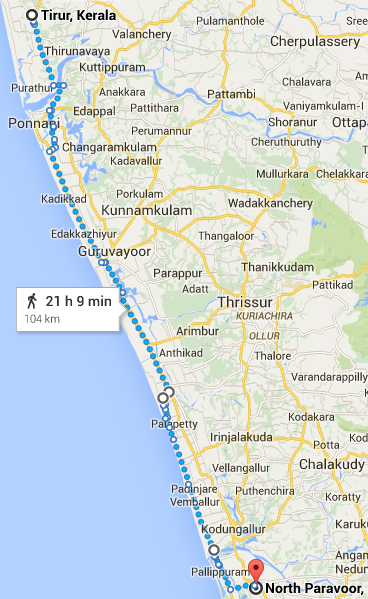 He suggested us we stay at Varkala beach, another 20km from Kollam, which is more like Goa, so that we can enjoy more. Today, we saw a change – the Masjids had given way to Churches, a lot of Churches. The local population too could speak better English. Tirur hotel tariff had a breakfast included option. And we didn’t want to miss out. However, we had to wait it was almost 8.15am when we got our room-service guy (a Nepali) to deliver Poori (almost like a bhatura) and aloo rassa (soupy like potato curry). It was yummy. But we were stuffing ourselves – generally by this time we would’ve covered 20 km. We finally left Tirur by 8.45am. We had our first big river crossing at Chamravattom where we headed south of Bharathappuzha river. 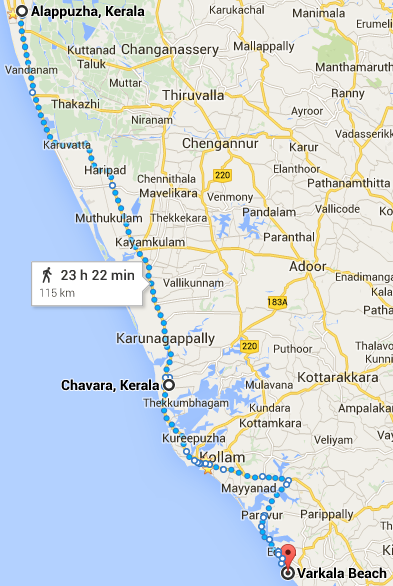 As we towards Chavakkad from Ponnani, we could figure out a change. The majestic, big bunglows were dwindling. The typical white-grey combination of colours now turning colourful and looking more local than urban. Probably the Saudi influence was lesser here. 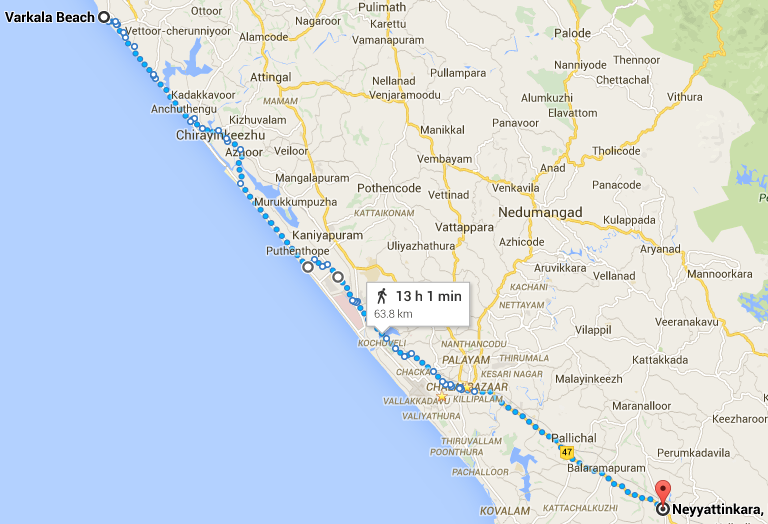 Even though the route to Chavakkad was flat and straight – it was boring. Riding on any highway is not a cyclist’s paradise. Even in the early sun of 10.30am, it was tiring. We stopped for our traditional juice break at Chavakkad and continued south, today we had to cross the longest river in Kerala, the Periyar River and head into North Paravoor. Around noon, it was getting utterly tiring we were close to Valapad where Surya asked if there is an alternative route. Google Maps suggested that there is an inner parallel route to NH-17 that continued right till Azhikode where it showed a ferry crossing for Periyar River. If the ferry didn’t work it was max of 2-3 km. extra riding. As soon as we took a right at Valapad for the beach road, the hot and dusty ride turned into a lovely canopied and cooler comfortable road. The flat straight big tar changed to a curvy smaller route. We stopped for coconut water refreshments and continued along the coastline. This road gave me the feeling of riding through Konkan villages, where the road is small, clean, trees all around. The houses not too big, colourful. Beetel nut trees swaying along with its Coconut cousins. No sooner we were in this scenery, we started to feel a lot better. The tired legs felt springy again and with more zest to continue further and longer. Along the way stopped near Majestic beach which was more of a rocky boundary to the Arabian sea. Had some Electral water and biscuts and continued down south. Around 2 somewhere before Azhikode we stopped for food. After which at Azhikode we waited for the ferry. There was a different queue for the cycles! On the other end at Munambam, we saw a local Kabaddi tournament. Teams from Kochi, Trivandrum, the local town, Thrissur and even from Kollam were participating. Kerala does promote sports much better than its siblings. Crossing the backwater at Cherai we got into N. Paravoor. We tried the inner city but couldn’t really find a good stay. Either it was out of our normal budget or just didn’t fit in. We decided to continue along the NH-17 and we found a hotel ‘White City’ around 6pm. Post our wash we went to a local Pure Veg. restaurant, again the menu was same. No real veggies available. Had to do with a Paneer subzi and Kerala Parota. Back at the room, we continued our dosage of Kollywood songs. But we couldn’t latch on to something specific as last night’s Shruti Hasan movie. Sleep was dead on time by 9 – 9.30pm.